This post is a little late in the making. About 2 months ago I gifted my little niece with a DIY playhouse that I made from an old bookshelf I found by the side of the road. 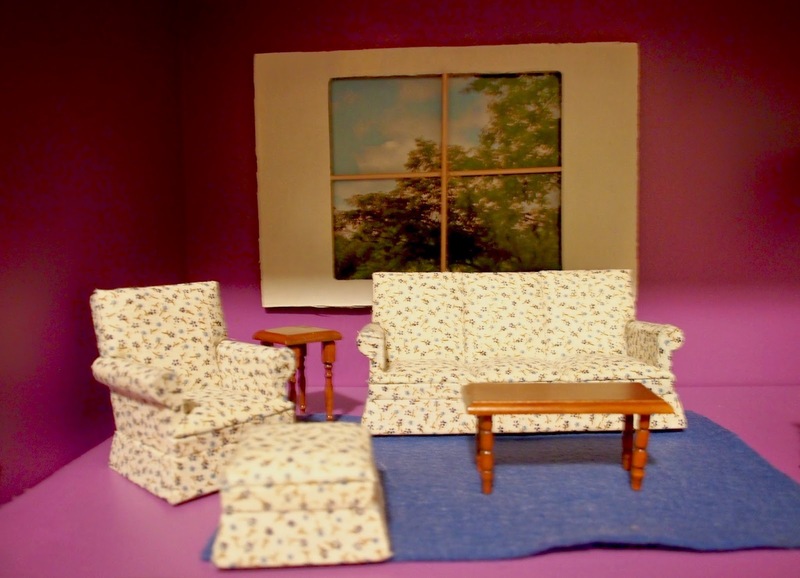 I've just been so busy with the move to Chicago, that I haven't had a chance to edit any of the photos I had taken from the dollhouse. So I literally found the bookshelf on the curbside and made my hubby pullover and pick it up. I then cleaned it off, sanded it and gave it a coat of primer. I followed that with a couple of coats of semigloss paint in this season's Pantone color of orchid purple. The choice of color was made easy by the fact that my niece Lila loves purple and her bedroom walls are a lovely shade of green that went with the orchid really well. 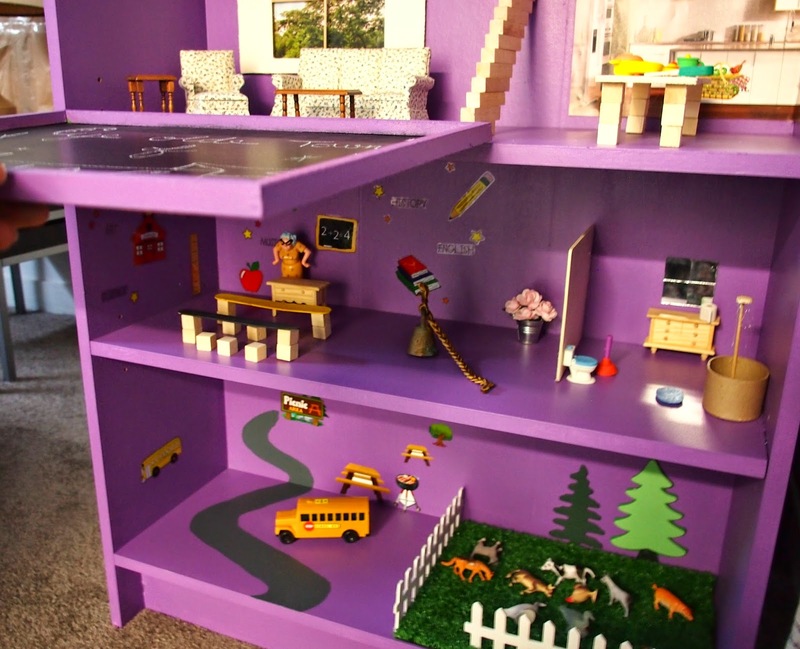 For the gabled roof of this dollhouse, I chose to connect two pieces of particle board together with glue and brackets and painted those too. I let everything dry and started putting together the contents of the rooms. To keep things interesting, I chose to not just make a dollhouse, but a little town instead, complete with a little classroom, roadway and petting zoo. I told Lila that when her doll leaves the comforts of her little apartment, she goes downstairs to school and takes a schoolbus to the petting zoo. For the most part she seemed okay with this and has played with all the little sections at one point or other. She really seems to prefer the little bathroom the most though. Not sure if it's because the little rubber toys in there included a little rubber plunger and even a little pile of rubber poop. 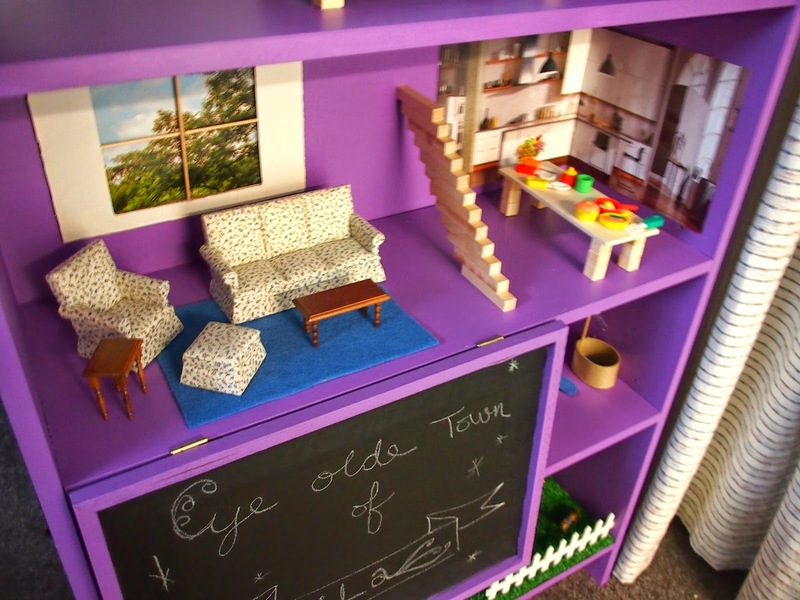 I don't know if you've ever looked for little dollhouse toys, but they are really expensive. 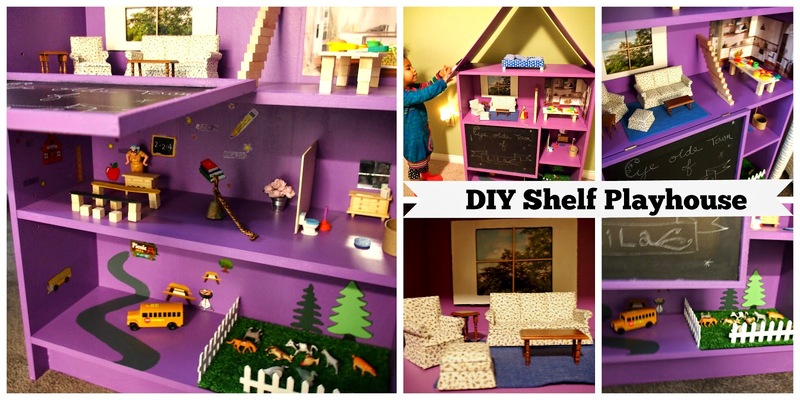 Instead I only bought one set of actual dollhouse toys (the little sofa set for $39 from Hobby Lobby) and the rest I played my hand at arts and crafts with glue, little wood pieces and dollar store toys. The rubber pots and pans and the toilet are actually eraser sets from Dollarama. 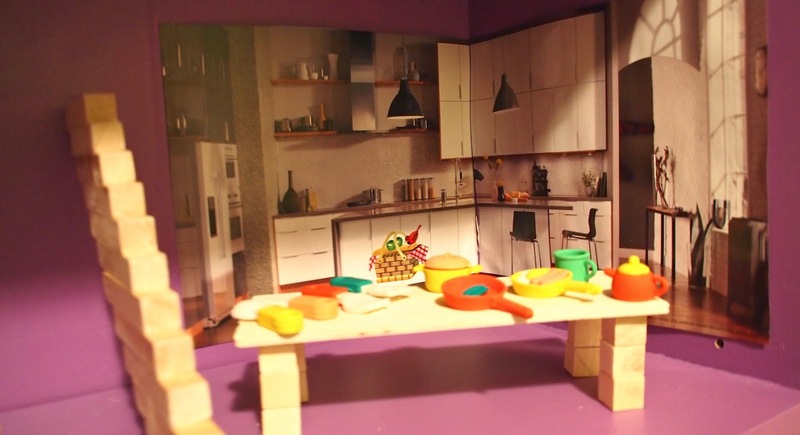 The kitchen consists of a photo if an IKEA kitchen cut out from the IKEA catalog. Other items like the window were made with found objects and rugs are made by simply cutting some felt. I also attached a little chalkboard on the front of the dollhouse to break up the space a little. The chalkboard is on hinges and can sit right up with a twistable nail I attached to it. The stairs I made were also used to break the space up and I made those from little wood blocks, you could use jenga pieces if you had them. Some sticky astro turf made a good grassy pasture for the little animals in the petting zoo and interesting bbq and classroom stickers helped decorate the walls of the school and the petting zoo background. I'm not sure how long this toy will last or continue to amuse her, but my sister can always revert the dollhouse back to a usable shelf for books and baskets. It feels so good knowing that I saved this little shelf from a bleak future at the landfill and helped it fulfill its destiny.